Tomato Roses Gourmet for a budding gourmet, show skill in the preparation of high quality meals and is a part of who we are. 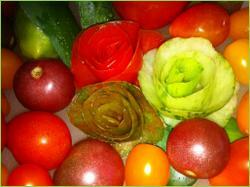 Placing a beautiful garnish on well designed and prepared food is certainly a good start. Follow the step-by-step instructions below and delight those for whom you are cooking (including yourself!). Select a medium to medium large tomato. 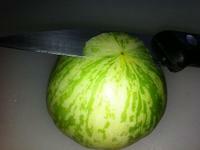 One with thinner skin is the best; your knife will cut through it more easily. The only tool required is a very sharp paring knife. 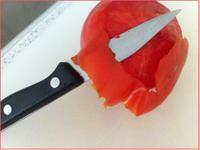 Place the tip of your knife on the non-stem end (the top) of the tomato. Begin cutting the top forming a kind of circular motion. Do NOT cut the top off! Continue as if you were pealing an apple in one long strip. 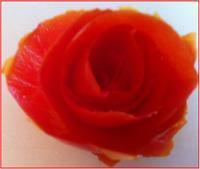 The less "meat" you peel, the more beautiful your rose will be. It may take some practice to get it as thin as you would like, but all it takes is a little practice. Even your very first efforts will be incredible. 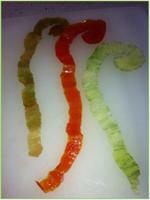 Keep on peeling all the way around the until you reach the bottom and have a long strip of the peel in front of you. 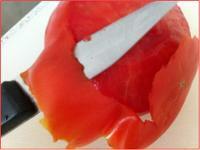 I work close to the counter surface to somewhat protect the delicate peel as is falls from the tomato. If you break the strip, continue peeling and at the end the two strips can be matched up and rolled and no one will ever know the difference. On your work surface you should have a nice long strip of peel with a kind of circle on one end and a straight(ish) edge on the bottom. Turn the smooth side down and you are almost done! Carefully begin to roll the strip beginning with the straight edge. The tighter you roll the first quarter of the strip, the more realistic it will look. Keep it gently taut as you work by pulling it toward you. When you reach the end you will see that the little circle becomes both the bottom "petal" as well as a little "platform" that holds it together. Lifting it and moving it around is not difficult. As delicate as the skin seems while peeling, it is fairly resilient once the peeling is complete and it isn't being dangled from the knife. If you feel like you would like to roll it again, (oh and once in awhile again and again) it will hold up to it, using a gentle touch. Now that you know the basics, you are limited only by your imagination. Look around for green, yellow, variegated or even purple varities for a different impact. The process is always the same. And do enjoy experiencing the absolute beauty of food!